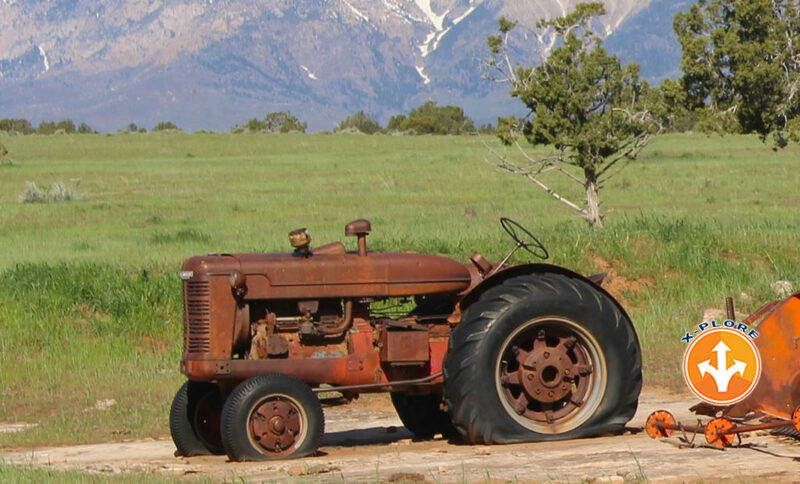 FEATURE — The old Farmall tractor and thresher that sit idly along the road on the west side of Smith Mesa haven’t been used in more than 30 years, but they stand just like museum artifacts – reminders of farming days that are long gone. Located northeast of Hurricane and Virgin along the western border of Zion National Park, Smith Mesa has an obscure history. 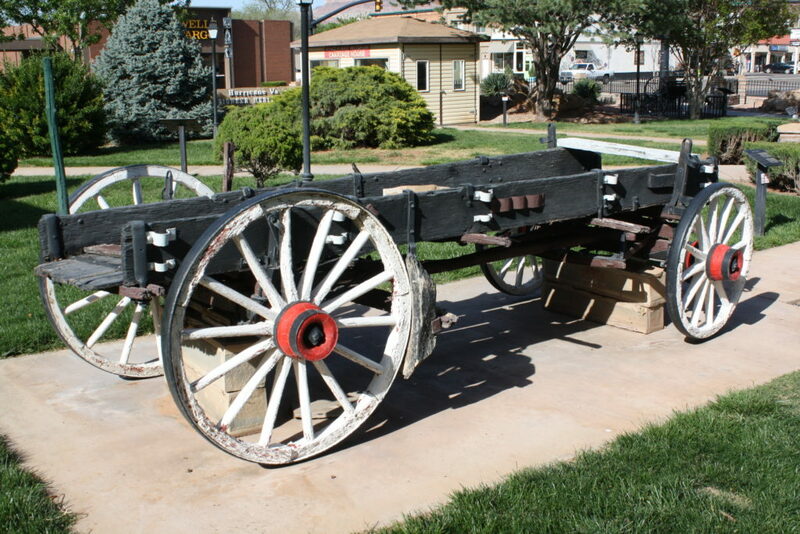 The only physical recognition of the mesa’s history in Washington County is at the Hurricane Heritage Park, where a plaque is affixed next to a wagon that belonged to one of the original homesteading couples, Harvey and Emma Ballard. 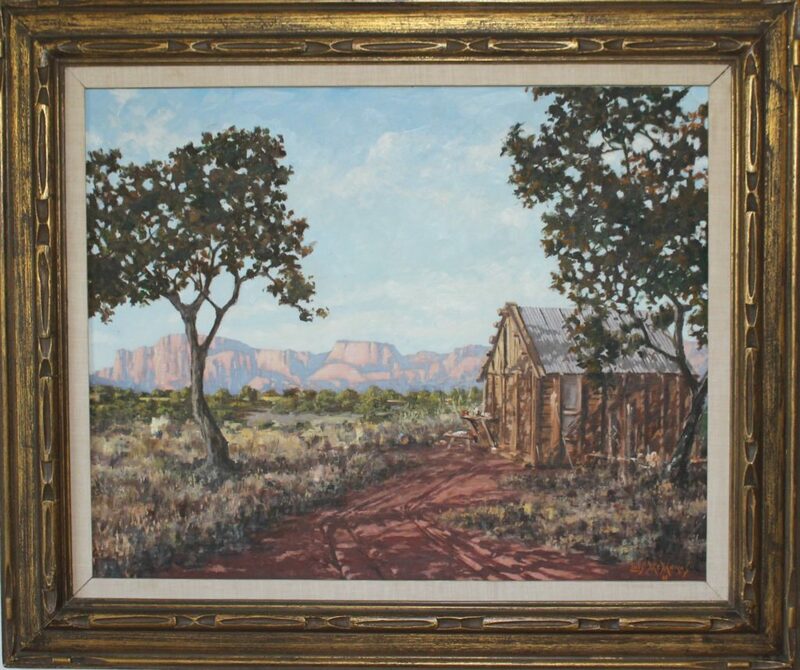 The mesa’s history, it seems, is much like Native American tradition, an oral history that, in this case, has been passed down from the homesteaders and landowners of the mesa. 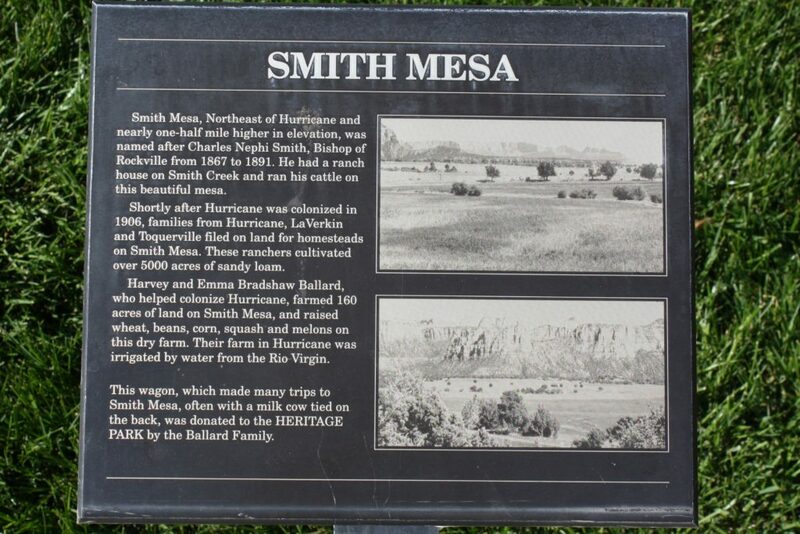 The mesa’s name came from Charles Nephi Smith, the Mormon bishop of Rockville from 1867 to 1891. 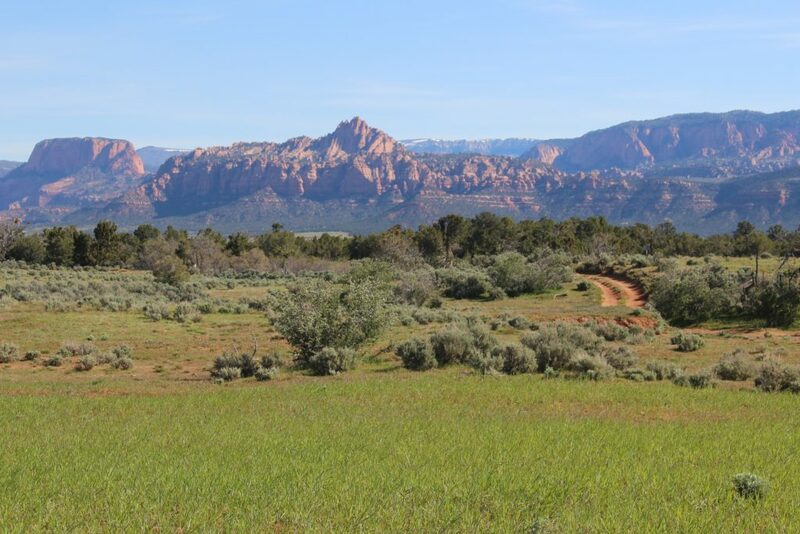 Smith ran cattle on the mesa and built a ranch house on what is now Smith Creek, which still runs just below Smith Mesa and within the boundaries of the Kolob Canyons section of Zion National Park. The isolated, hard-to-reach location begs the question, why would anyone want to homestead there? 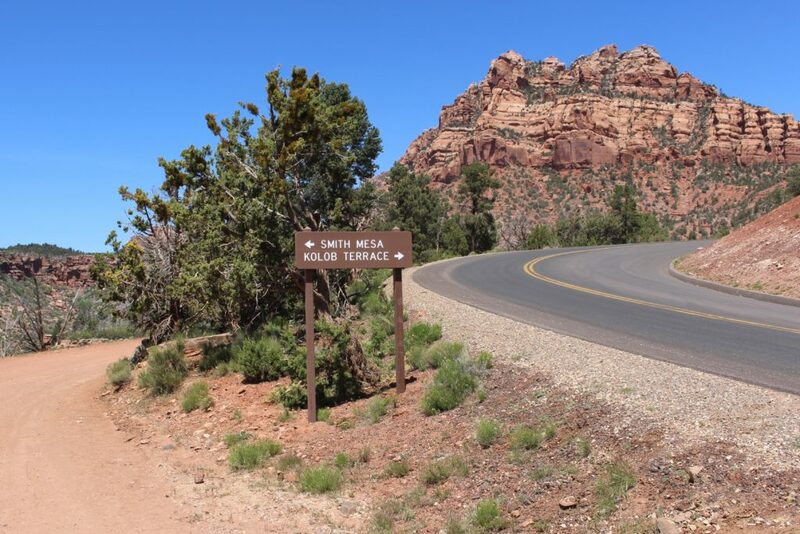 Even by today’s standards, it’s still not easy to traverse the steep, switchback-filled roads going to and from the mesa. High clearance, four-wheel drive vehicles are definitely preferable when making the trek. 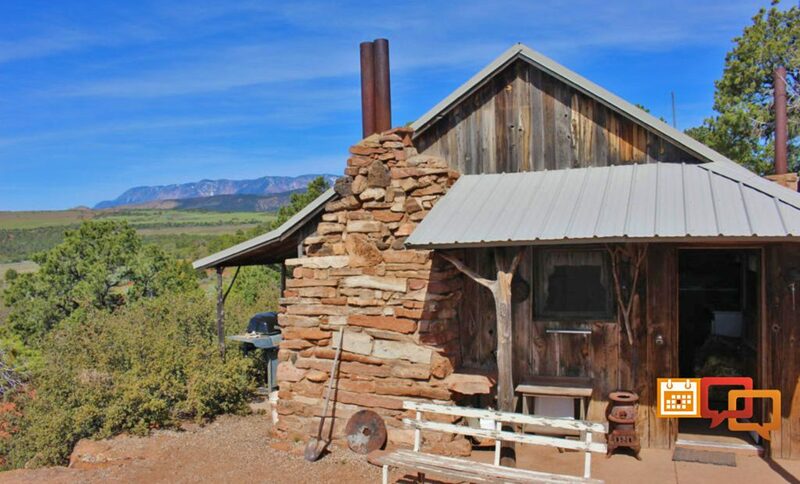 The first group of homesteaders in 1912-1913 came with unwavering optimism, as far as some old-timers can piece history together. 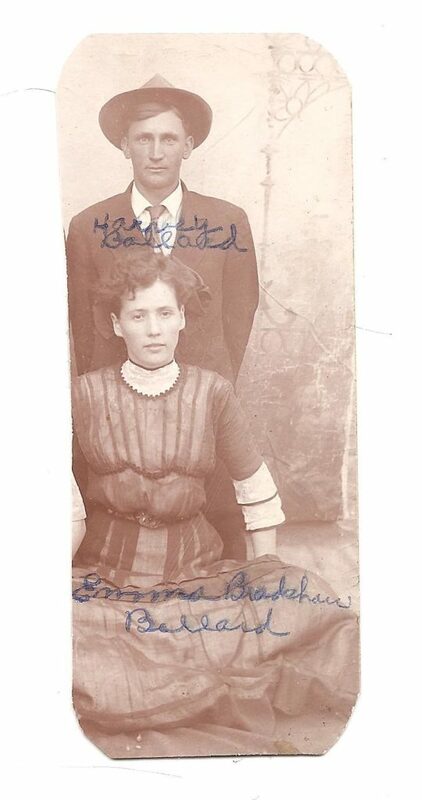 Most of the family names of the original homesteaders are well-known in the eastern part of the county, including Bradshaw, Ballard, Cottam, Kleinmann, Ruesch and Wright. 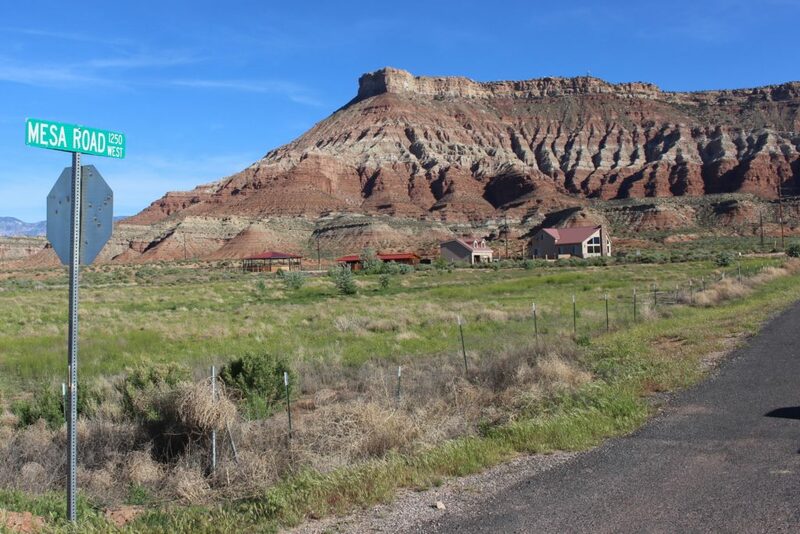 The first batch of homesteaders chose the prized flattest parcels on the mesa’s west side, and later homesteaders settled for the less-flat eastern parcels. 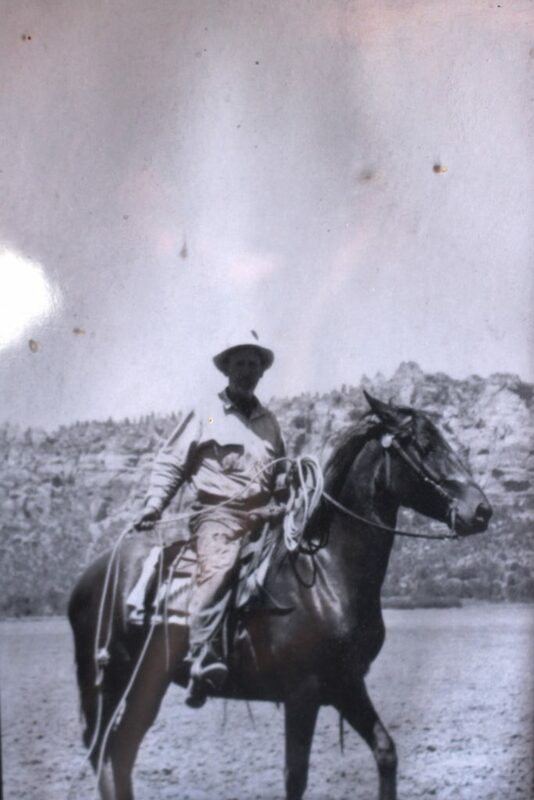 Delmont Wallace, whose grandfather Hamilton Wallace was one of the mesa’s original land claimants, has spent a lifetime farming and ranching up on the mesa. At the time of his grandfather, Wallace said, Smith Mesa was considered one of the last places to homestead in Washington County. “It was a ‘Last of the Mohicans’ when it came to homesteading,” he said. 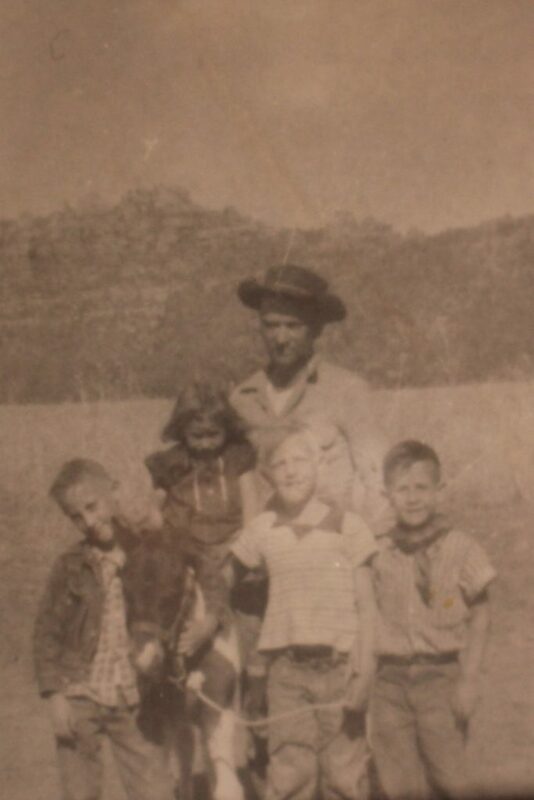 Carl Wadsworth, Harvey and Emma Ballard’s grandson, owns part of his grandparents’ original homestead along with his siblings. “They thought they were going to make a fortune and it was a fairly good living in those days, but it was very hard work,” Wadsworth said. Wheat became the main crop, but some homesteaders also raised beans, corn, melons and squash. Perhaps most impressive was that they did it without any irrigation. They were all dry farms utilizing only rain – when it did rain. 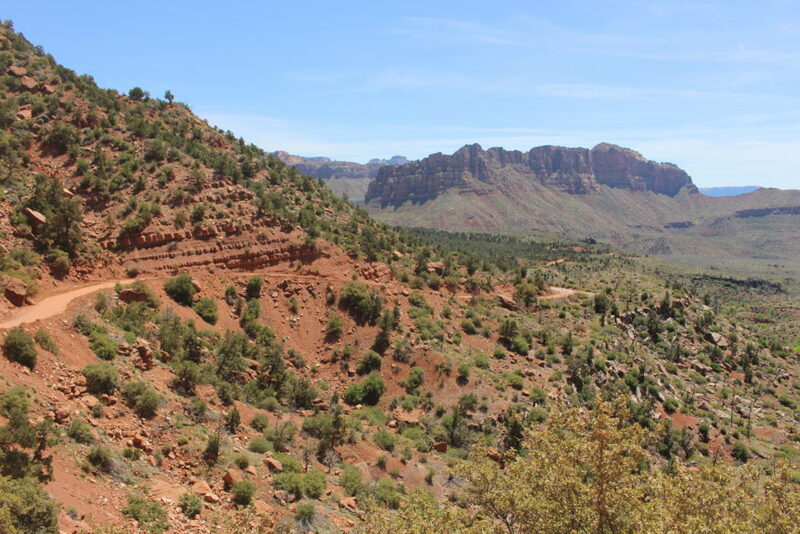 The mesa’s higher elevation, approximately 5,000 feet, meant there was a better chance the moisture would last longer. Most of the wheat planted was red winter wheat, sowed in the fall and harvested the first of July, all done with horse-drawn plows and threshers. To make best use of the limited precipitation, the farmers would plant a crop one year, harvest it the next year and then let it lie fallow the year after, keeping it as free of weeds as possible to conserve moisture. The third year, they’d plant again. In theory, they were using two years worth of precipitation for one growing season. Average production was approximately 20 bushels per acre, and a good year netted 30-35 bushels per acre. Wadsworth started going up the mesa with his grandfather in the late 1940s in the iron-tired wagon on display at the Hurricane Heritage Park. Planting was sometimes difficult due to weather and the sandy soil. The north wind would frequently sweep through and blow out the topsoil. See more in video top of this report. 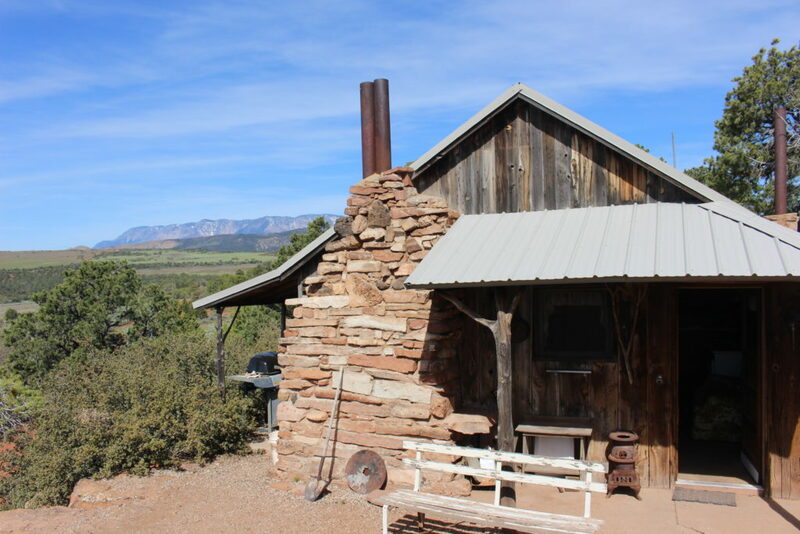 True homesteading is typically defined as living on the land and improving it, but practically none of the original homesteaders made the Mesa their permanent home. “The homesteads were not really overseen very well,” Wallace said. Some built small, one-room cabins for extended stays but kept their roots in the towns below. 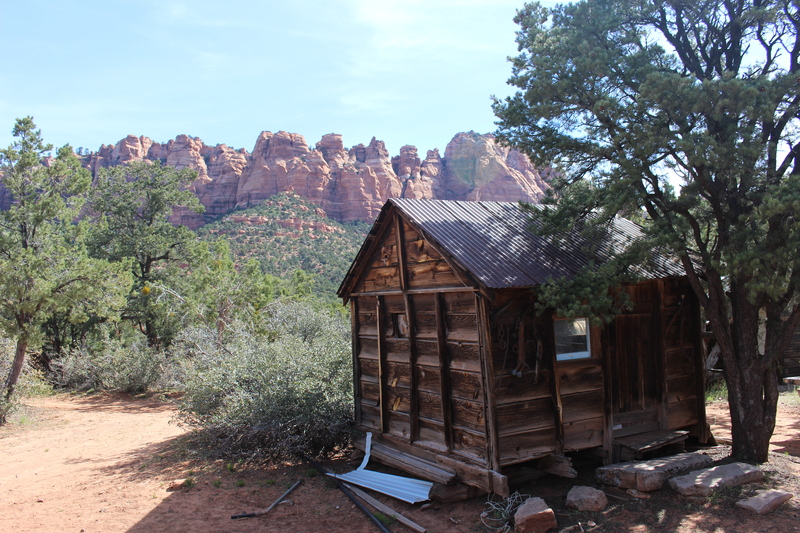 For instance, Ballard built a bunk house near Rock Spring, a viable water source, and farmed the land above the spring. That bunk house has since been moved next to a Louis L’Amour-type cabin one of Ballard’s sons built out of leftover lumber from his construction jobs. In addition to their farms, homesteaders also brought livestock, primarily sheep and cattle, building fences to keep them out of the wheat fields. 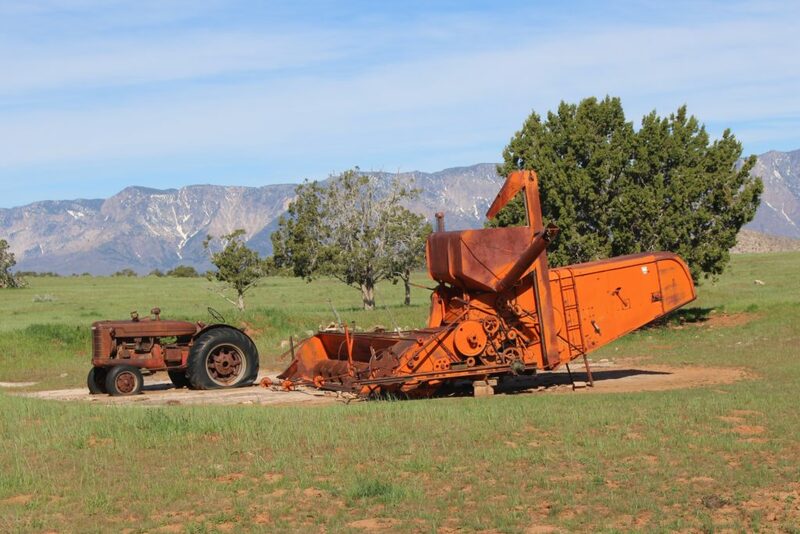 Later on, tractors made it easier to harvest the wheat, but in truth, none of the original homesteaders or their descendants who took over their land on the mesa really hit the jackpot like they thought they might. By the 1960s, the farmers had practically ceased raising wheat. By then, some parcels had been put in a government “land bank,” and because of a wheat surplus at the time, farmers received government subsidies not to grow a crop. Ironically, those subsidies became the first real money some of the farmers earned. 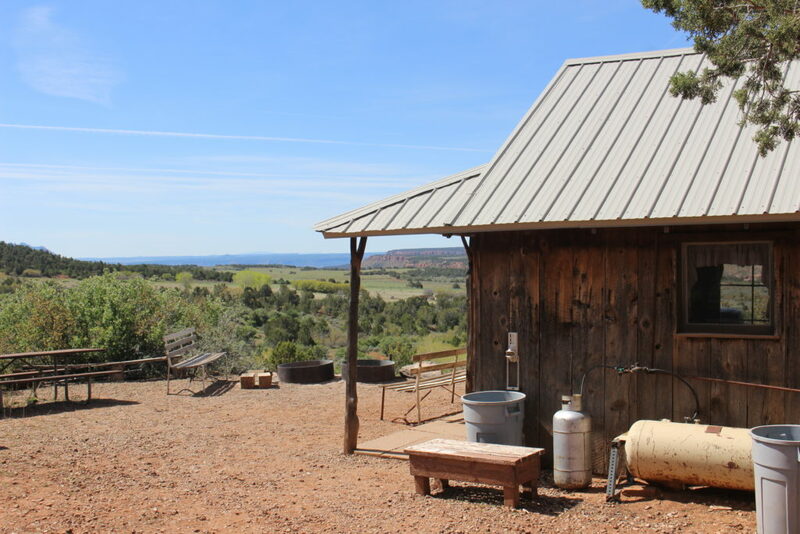 Today, few of the Smith Mesa landowners are descendants of the original homesteaders, and farming has given way to ranching as the land’s primary use. 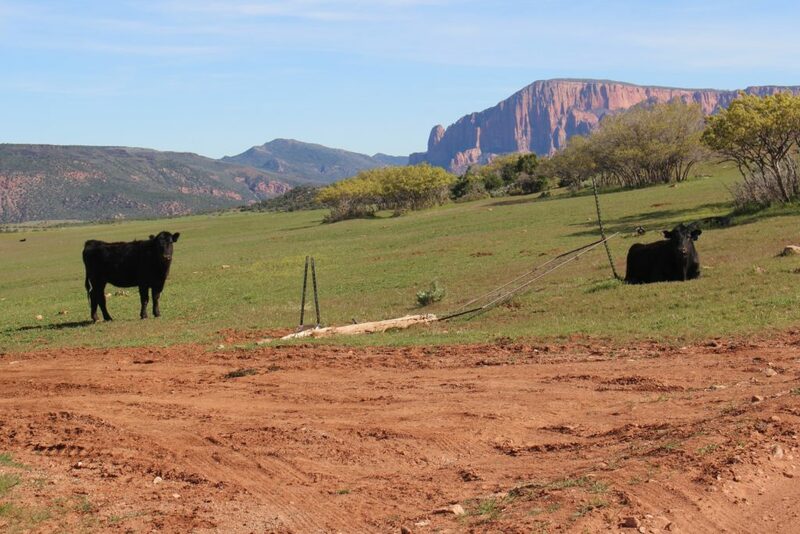 Wallace, who feels like he basically grew up on the mesa and “lived to farm,” sold his acreage on the mesa within the last 10 years. “It’s like cutting your arm off,” he said about selling his land. 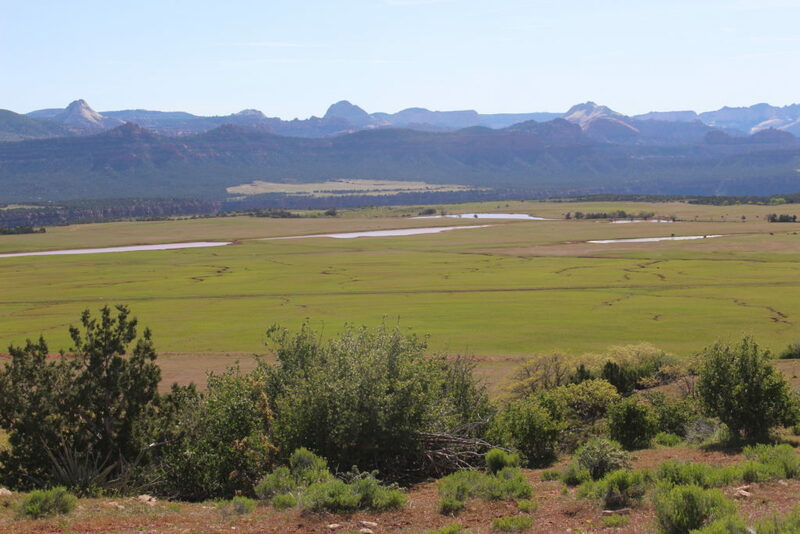 Though the wheat is gone, the mesa is still a cattle grazing haven. These days, Wadsworth grazes a small herd of cattle “up on Smith’s” – as the old timers say – with one of his brothers and a cousin. The land’s other use today is recreation. 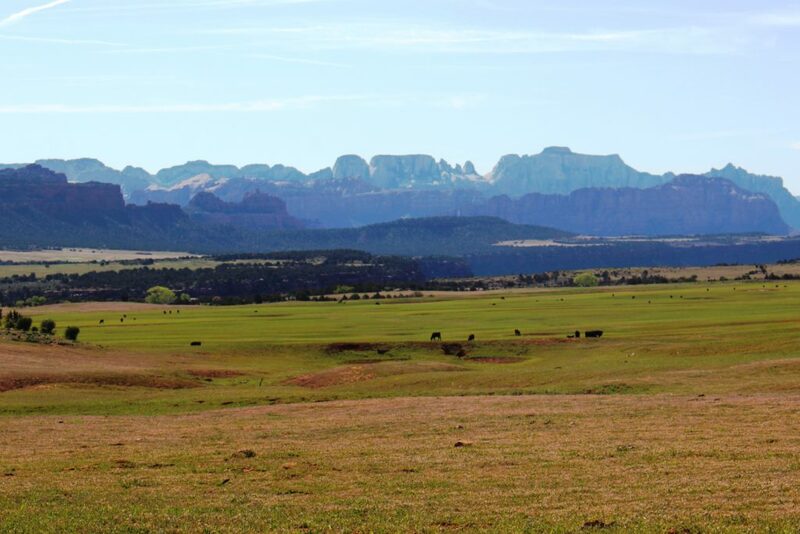 Landowners and their families enjoy getting away from it all and holding family gatherings on the mesa. It used to be a prime hunting ground for deer, its heyday in the 1940s and 1950s, but the good hunting has waned ever since. 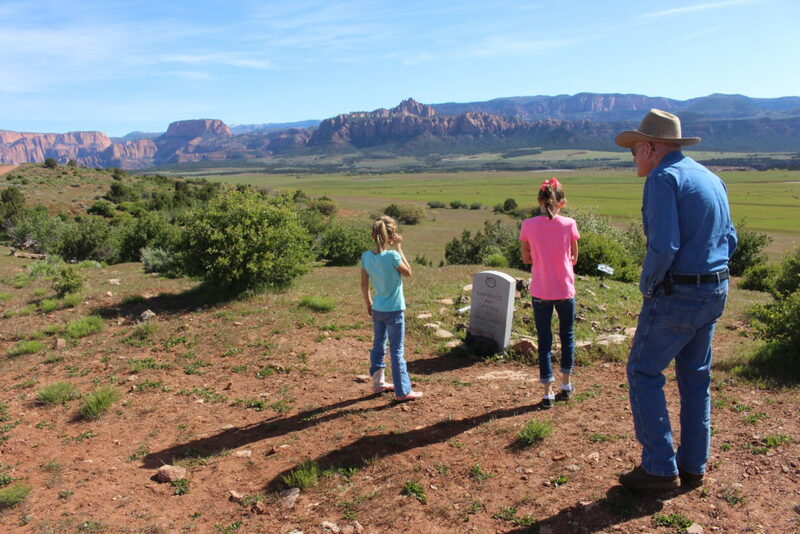 While most landowners only come up temporarily, some live on the mesa permanently, including Chuck Cottam; his wife, Debra; and their son. 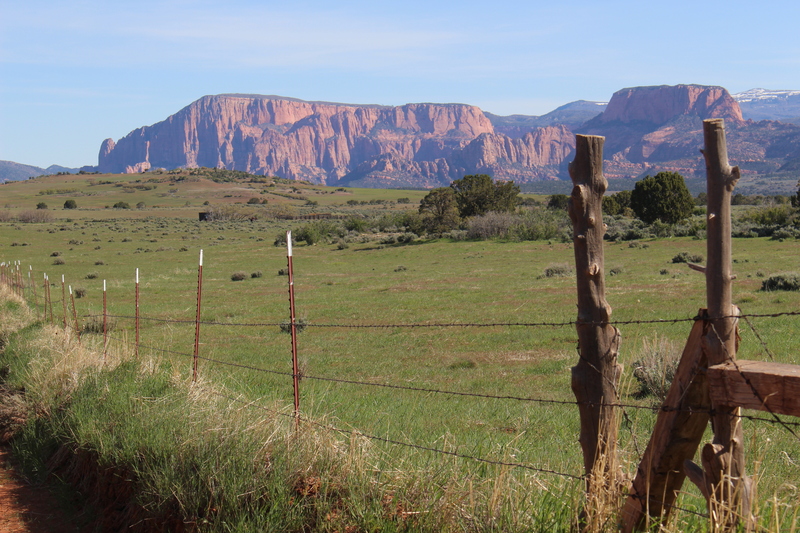 Other Smith Mesa regulars agree with Cottam about the scenery. 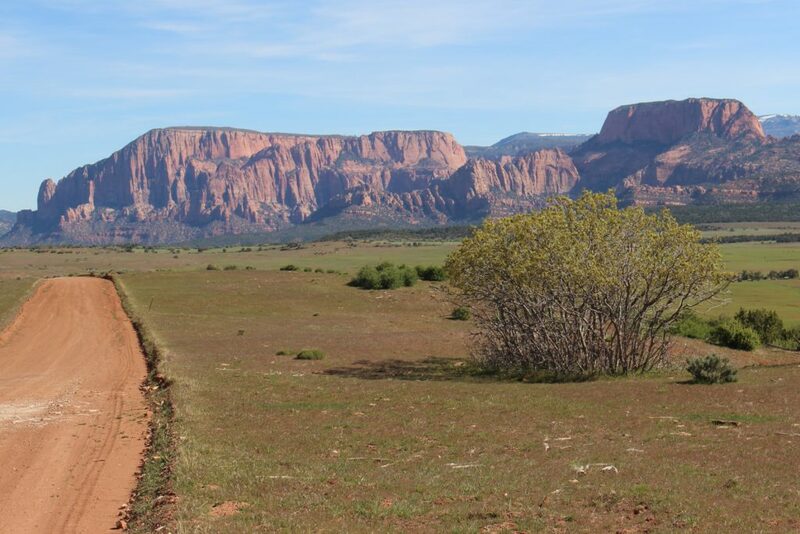 Smith Mesa arguably provides one of the best views of Zion from outside the park, with a window into three major sections: Kolob Canyons, the Kolob Terrace and the backside of the Towers of the Virgin near the mouth of Zion Canyon. 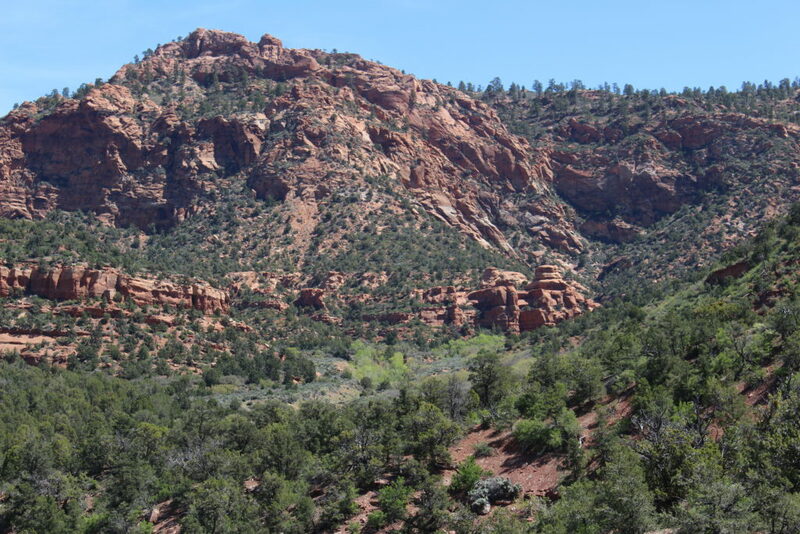 The scenic drive can be done in a loop, starting from the Mesa Road on the west side of Virgin. 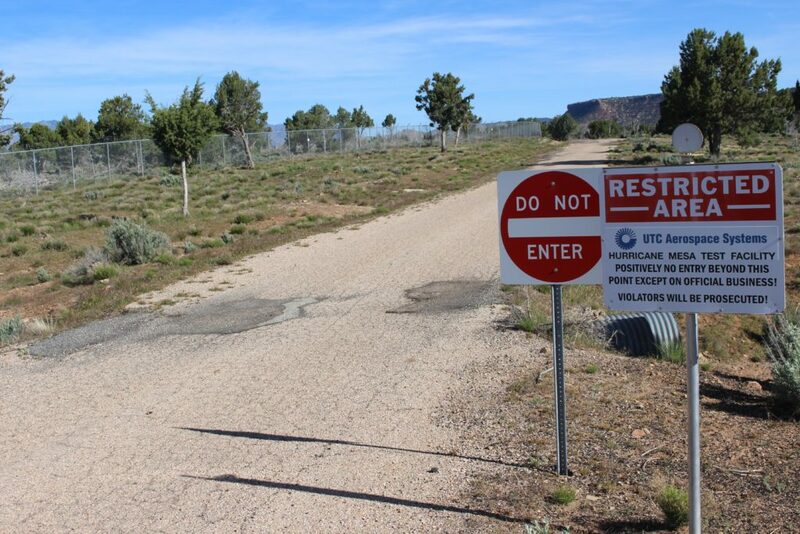 The narrow, winding Mesa Road is paved but not well-maintained. The road actually becomes smoother once the pavement ends because the dirt road on the west end of the mesa is graded. 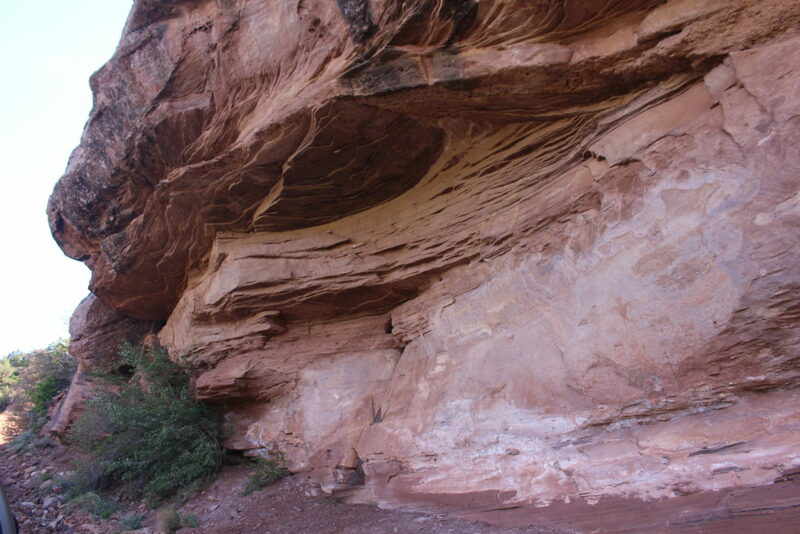 Approximately 5.9 miles from the Mesa Road turnoff, the road starts ascending a hill where a rock panel on the right displays two pictographs, a triangular man and a deer (or antelope), evidence of the mesa’s earliest inhabitants. 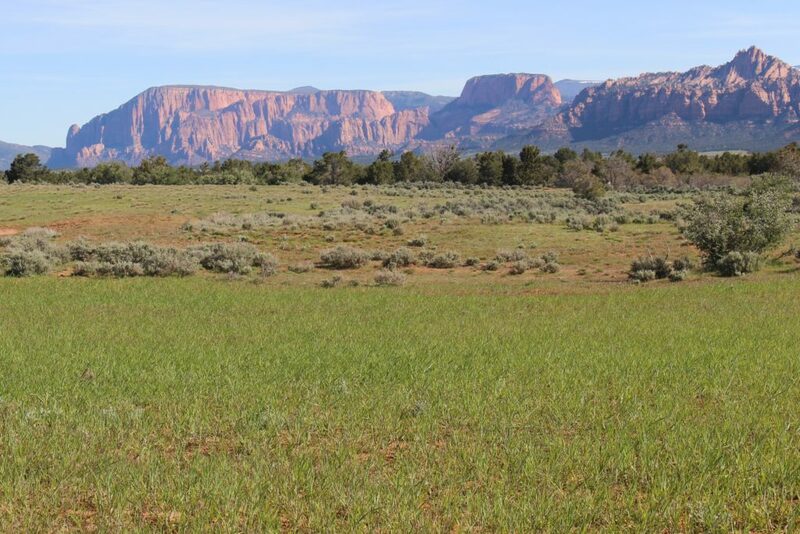 Spring is the best time to visit the mesa, when the pasture lands are emerald green. 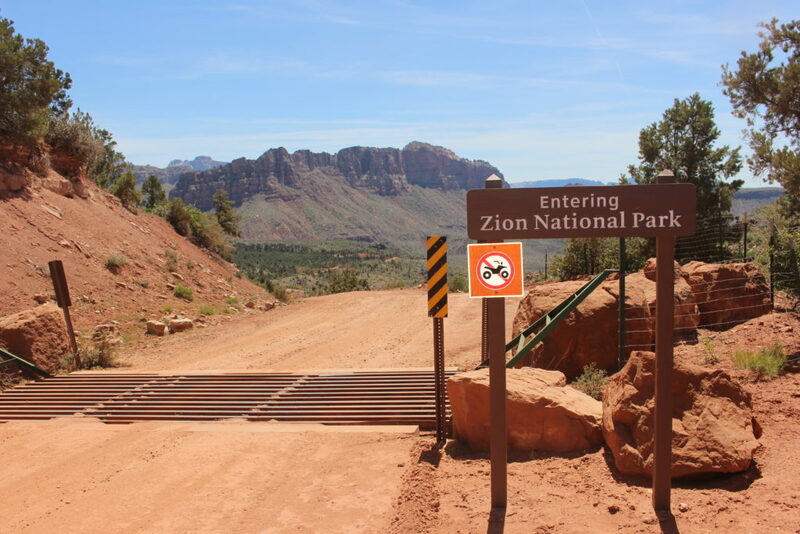 A trip in July and August would present a different view of browns and yellows, but the views of Zion’s splendor are the same. 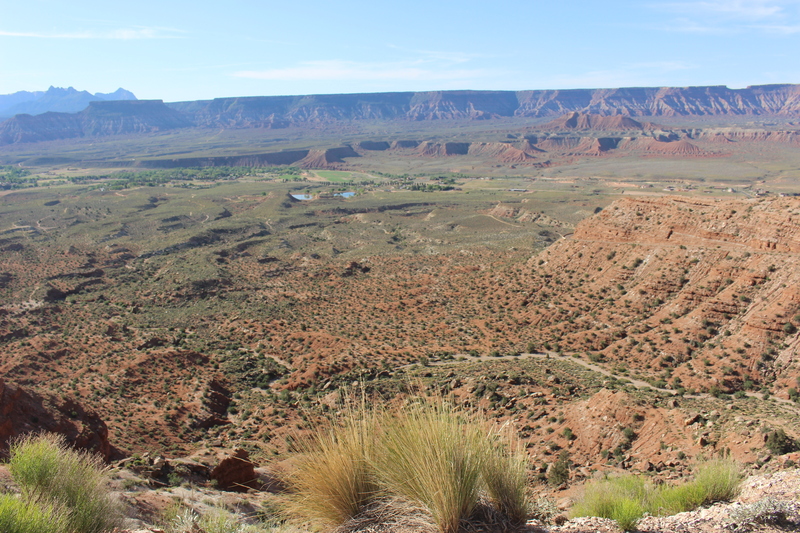 The road encircles the mesa with each turn providing a different photoworthy panorama. On the drive one will see many more cattle than people, but unlike many tourists, the cattle keep their distance. As the road turns east off the mesa, it descends via switchback with nearly sheer cliffs on one side into juniper forest where a sign marks the entrance into Zion National Park. 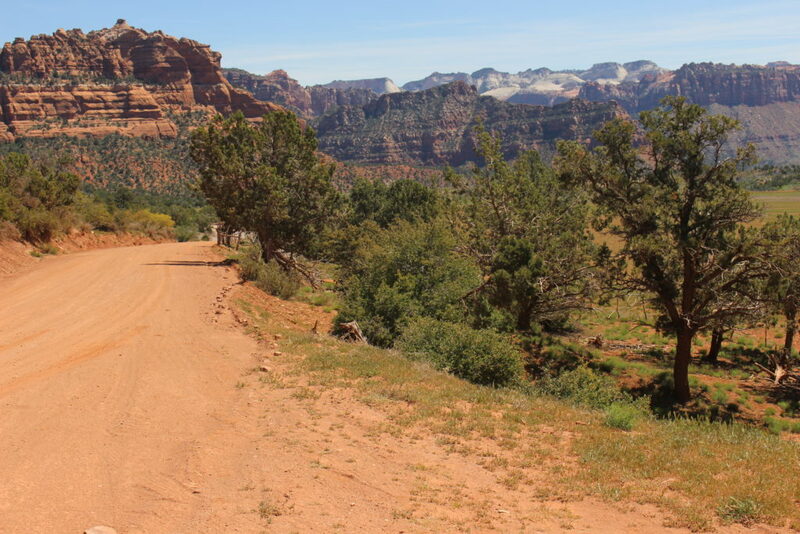 The road ends at its intersection with the Kolob Terrace Road, which terminates in Virgin. For those tired of Zion’s crowds, Smith Mesa offers a splendid escape and just as breathtaking vistas. Ed. note: Carl Wadsworth, featured in the video included in this report, is the author’s father. Photo gallery follows below. Click on photos to enlarge, use left-right arrow keys to cycle through the gallery. For previews on Days Series stories, insights on local history and information on upcoming historical presentations, please “like” Wadsworth’s author Facebook page.